Does a site's brand list sound more like a random mix of popular names? 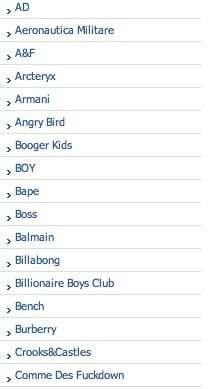 When was the last time you saw Angry Birds T-shirts sharing retail space with Balmain jeans and Crooks&Castles? Probably never. Counterfeit sites thrive on confusing people who want what's popular, not curating a retail experience for the discerning customer.